Ålesund has again and again been awarded “worst city to bike in”. Hopefully that will change soon. Overuse of cars in Ålesund city centre is putting the city’s beautiful surroundings and unique architecture to shame. Luckily organisations such as art gallery KUBE are putting bikes on the agenda. If you have ever tried to get from one part of Ålesund city centre to the other you would know that it is a nightmare. Growing up in the mid sized west coast city, both Bikevibe-editoris surely does. The traffic is jammed for hundreds of meters on a daily basis, especially at peak times. Nevertheless, instead of switching it up and walking or biking to work, people continue using their car to get from a to b and the politicians and city planners seems lost as to what to do to solve the problem. The result is a city centre that is messy, loud and contaminated – putting its beautiful surroundings and unique architecture to shame. Ålesund has again and again been awarded “worst city to bike in”. Hopefully that will change soon. One of the organisations putting bikes and city planning on the agenda is Jugendstilsenteret and art gallery KUBE. Their main exhibition in 2016 is titled BYEN (CITY) and is a complex exhibition about city, urban development and urbanization. The exhibition will open in June. As a warm-up the organizers have invited to a “bicycle day” in the art gallery’s locations on April 23rd. There will be free bicycle repair shop, talks and movies. 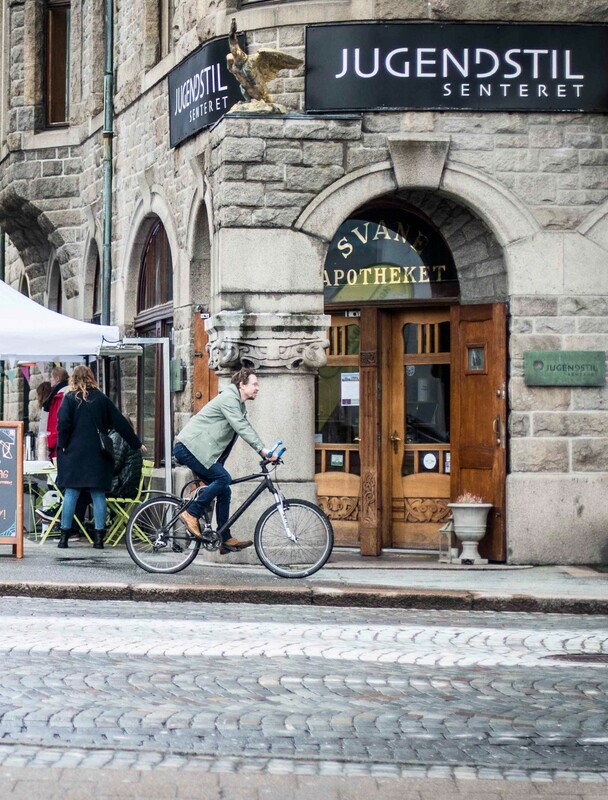 Architect in Ålesund Kommune, Gudmund Hoel, will talk about the city’s bicycle plans. Bikevibe thinks this is a great initiative, and we’re excited to see what comes of it! You can find the full program for the bike day here.